Welcome back to our blog series on the pros and cons of allowing pets in your rental property. By allowing renters to have pets, you’ll likely have more renters to choose from, and could potentially see some financial benefits as well (check out our previous post for more details). But as is the case with everything in life, there’s always a catch. Our non-recourse loan lenders are going to explain some of the downsides to allowing pets to your rental property. We hope that this information will help you find the best solution for your investment property. Even though we are only involved with the non-recourse loan aspect to acquiring a rental property, we want every investor to be as well-informed as possible, in every step of the rental property journey. 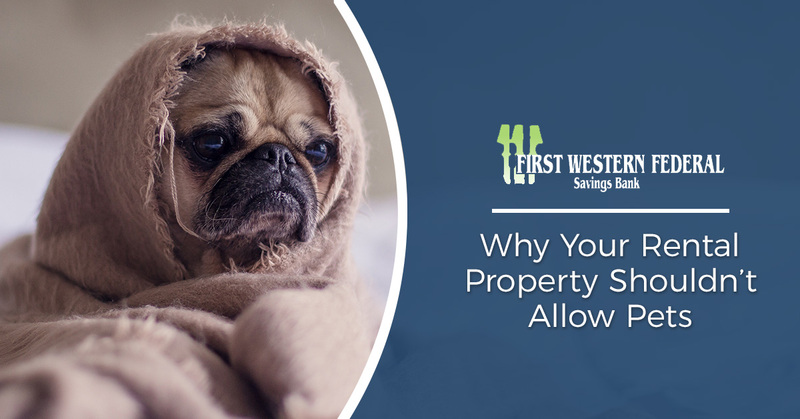 Learn more from our blog on the drawbacks of allowing dogs and cats, and work with First Western Federal Savings Bank for refinancing, purchasing rental property, vacation property rental loans, and so much more! Dogs and cats are the best, until they’re wreaking havoc on your home. When it’s your home, that’s one thing — you know how to properly clean up and repair any damage. But when it’s your rental property, you want to ensure this investment is gaining as much revenue as possible. Understandably, you don’t want a pet to be one of the sources of your financial losses. Any pet owner will be the first to tell you that every animal has their own personality. However, much of this develops from owner expectations. 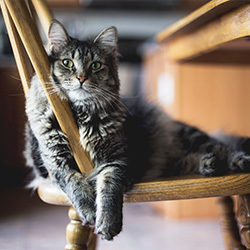 When it comes to allowing pets in your rental property, there’s a lot of room for error — and a lot of this is due to the human in the household. When animals are anxious, stressed, isolated, hungry, or full of energy, this is nearly always the cause of torn up carpet, scratched up doors and walls, or other examples of damage. So much of how a pet behaves is based on their owner. If the same owner ended up living in your rental property but didn’t have a pet, there’s a good chance you wouldn’t have nearly as many costly repairs to take care of after they move out. Not only does your chance of property damage increase due to the actions of the owner, but also because of the animal itself. Every dog and cat are going to have accidents at some points. This could be a small ordeal that’s easily remedied, or it could be a situation that metastasizes because the owner doesn’t take clean up the damage appropriately. In an ideal situation, you get a perfect tenant and a perfect dog or cat or salamander. But one of the biggest downsides to allowing pets is that until they move in, you probably won’t fully know what you’re getting yourself into. On one hand, holding out for a tenant without a pet could cost you money. You might not be able to find a renter as quickly as you’d like. On the other hand, if little to no time is lost looking for a renter, you’ll probably save money in the long run. Scratches in the floorboards, rips or stains in the carpet, the massive amounts of pet hair — these things ruin the integrity of your rental property, and end up costing you money. Depending on how extensive the damage is, a pet fee might not be able to cover the expenses. If you don’t want to deal with the possibility of costly repairs, allowing pets might be a major drawback for you. Allowing big dogs in tiny apartments is nearly always a recipe for disaster. If you use your non-recourse loan to purchase a house that has a yard, it’s probably not as problematic to allow for bigger animals. But as we mentioned earlier, pets who cause damage are usually bored or anxious. If your property doesn’t seem suitable for pets (or for certain pets, like dogs over a certain weight), it’s more than fine to put some limitations in place. Ultimately, you have to be the judge of whether or not you want to allow pets in your rental property. If you see more disadvantages to closing off a large portion of potential renters who have pets, you can put some rules in place to ensure the maximum profits with as minimal damage as possible. Check-In Forms: Have tenants take a detailed account of the state of everything in the property within the first 48 hours of their moving in. Compare their initial account with the state of things upon moving out, and hold them accountable for any obvious differences (other than the expected wear and tear). Pet Deposit: Depending on the area and price of the security deposit, charge at least $300 for each pet that’s living in your rental property. You can otherwise add a monthly fee onto their rent. Set Limitations: Worried about a Burmese Mountain Dog wreaking havoc on your property? Not wanting animals who shed? Put these expectations in place in the lease agreement. You shouldn’t have to sacrifice your personal level of comfort when renting out your property. Our non-recourse loan lenders wish you luck in getting your property set up. Remember that the first step to setting up your rental property is applying for an IRA non-recourse loan with First Western Federal Savings Bank! We look forward to working with you.